Network Security is still a high priotity for organizations; the right perimeter means more threats stay outside and sensitive data remains inside. 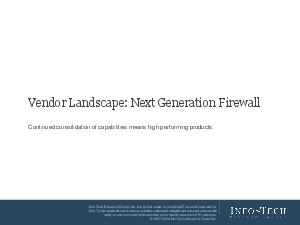 This Info-Tech research paper is designed for enterprises seeking to select a solution for Next Generation Firewall (NGFW). Understand what's new in the NGFW market. Evaluate NGFW vendors and products for your enterprise needs. Determine which products are most appropriate for particular cases and scenarios.